Of course, this can be applied to any paycheck, not just military ones. It's a bit simpler than using software like Mint or Quicken and a bit more complex than pen and paper. It gets the job done for my wife and me, so take it for what it's worth. Military pay comes every 1st and 15th of the month. If the 1st or 15th falls on a weekend or public holiday, it gets pushed to the first working day before the weekend or holiday. If you have USAA or some of the other military friendly banks (PenFed, Navy Federal Credit Union, etc), you'll get your money direct deposited a full business day prior to when the funds are actually released from DFAS (Defense Finance and Accounting Service). This is great peace of mind. You can schedule automatic withdrawals, payments, and fund transfers to occur on every 1st and 15th of the month, and be sure that you won't overdraft because you know that the money will have gone in (at the latest) the day prior. The program we use to budget is Google Docs. It's free and comes with every GMail account. You could just as easily use Microsoft Excel or any other spreadsheet program, but Google Doc's sharing ability (between my wife and myself) and it's worldwide accessibility make it a no-brainer product for me. Before any money reaches our checking account, a lot of it comes out in the DFAS myPay system. Income tax, social security tax (FICA), Medicare tax, my SGLI, my Family SGLI (life insurance for my wife), and an allocation for my Roth IRA. The Roth IRA allocation is currently set at $416.66 per month. This results in $4999.92 deposited into my Roth IRA account every year, which is 8 cents below the legal annual contribution limit. Setting up allocations through myPay is pretty easy once your logged in. I'll cover how to do that soon in another post. We put all of our recurring and mandatory expenses in bold and towards the top. 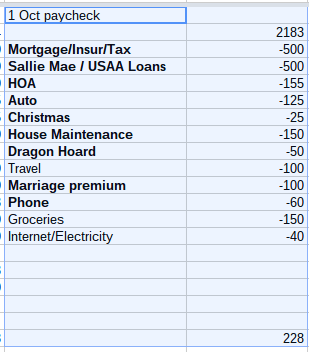 Mortgage payment, HOA (Home Owner's Association dues), phone, groceries, and internet/electricity all go into a separate “Bills” checking account. That's so when we look at our Joint Checking account, we can see exactly how much money we have left over until the next paycheck. The Auto (our car payment to ourselves, since we don't have a car payment to send away to the bank) and Christmas money is automatically transferred from the Joint Checking account into individual, targeted savings accounts. The Travel money I've been manually transferring, only because some paychecks we need the extra $100 to cover a travel expense from the previous paycheck. 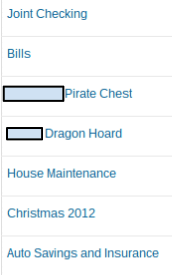 The Dragon Hoard expense is for two $25 transfers into separate savings accounts for my wife and I, so that we can save for whatever we want. It's a similar concept to the “marriage premium” I describe below. We call it our dragon hoard because we feel like dragons sitting on a pile of gold. A bit nerdy, I know. But who says you can't have fun with budgets? The “Marriage premium” expense is an idea from a marriage advice book that we picked up before we got married. It is a non-negotiable expense that we include in every paycheck. My wife and I get $50 every paycheck that we can spend on anything we want. If I want to buy beer, that's my beer money. If she wants new makeup, that's her makeup money. If I want to go play blackjack at the casino, I've got my marriage premium and my dragon hoard. You get the idea. It's a great way for us to never have many petty arguments about money, because we each agree on the budget every two weeks, and we each have our own spending money that the other can't question. I used this same system when I was single (obviously without the marriage aspects) and it seemed to work well for me then as well. What if there's extra, unaccounted for money? That way we reward ourselves for staying on budget while still sweeping up the left over money to tackle our student loan debt or accomplish our financial goals. What do you think of the way we're budgeting? Too complicated? Too messy? How would you do it better?